My experience started with chasing the team that had left Belgium for Dover via Calais following Jason’s unexpected early departure to cross the channel during a weather window. 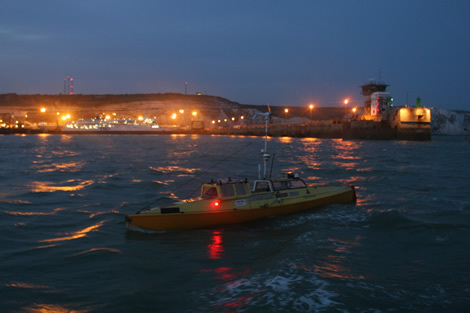 I arrived in Brussels from the US and after 3 trains, a ferry and a taxi ride later with what I later called ‘the grey beast’ of a wheeled suitcase, I was standing alone on a windy, cold pier in Dover at dusk with the cliffs looming ghostly behind me. I was feeling pretty lonely and very tired. But no amount of jet lag would beat me. Cell phone input couldn’t confirm it but I was sure Jason was coming. I waited and waited. It got dark. I waited. And then I gave up. I took one last look out toward the distant harbor entrance before heading back the half mile walk to the dock. But wait! There, at the far edge of the harbor entrance, were two tiny red and green lights winking close to the water and next to them, higher up, lights of another boat. It had to be them- Moksha and the chaperone boat. I went from sad sack to ballistic in seconds. I began a mantra of ‘Just keep coming Jason, just keep coming’. After a lunatic performance of waving a white scarf that Jason later said he never saw, they came closer finally. I yelled ‘hello’ from the pier and began to run back like a maniac to the dock where I met up with the others –most of whom I hadn’t seen in years and others I met for the first time but certainly knew from journal entries. I hugged them all and Jason too and then asked permission to board Moksha whom I’d not seen since Hawaii. Jason invited me to pedal ‘Moksha’ with him from Gravesend to Erith, about 10 miles, on the eastern end of the Thames on Thursday Oct 4th. It was a beautiful day with a beautiful sunset -and a wonderful incoming tide. Pedaling Moksha is like pedaling up a moderate hill that never ends. Once you get used to it, it seems reasonable. It’s the first 45 minutes that you wonder how they ever got across the Channel in the first place let alone across oceans. The steering was suffering a hang up but it is usually responsive - like turning a bus. Everything you need is within reach of either you or the other guy but you do have to be very mindful of the turning metal pedals that can claw down a misplaced leg. Jason boiled water for tea during our trip and we enjoyed some celebratory chocolate candy at journey’s end. I can’t thank Jason enough for the chance to pedal some distance in Moksha on the Thames. Jason said he wanted to return the favor. 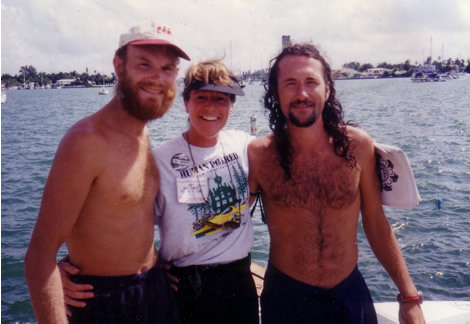 What he was referring to was that in the summer of 95, during what turned out to be one of the hottest summers in the Southern US on record, Steve Smith and Jason began their way west from Ft. Lauderdale, Florida on the Atlantic coast to San Francisco, California. My ‘favor’ to them was to get 3 small pedal boats to the east side of Tampa Bay (Florida) for us to get across to St. Petersburg, about 9 miles, where I live. It was shorter distance and less of a hassle than getting there by bike and inline skates but turned out to be slow torture on the windless day under the sun –for 3 hours. I can only hope that neither Steve nor Jason remembers the deplorable heat that day on Tampa Bay. By far, I got the better deal. 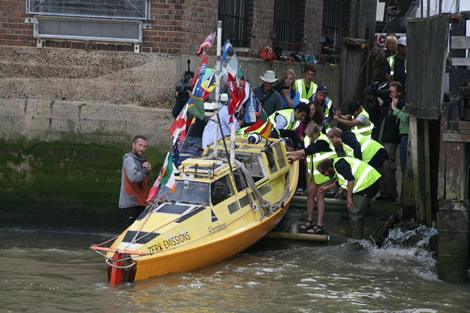 There are some Moksha maneuverings from water to land or land to water that we will remember from this time, but the trickiest by far because it had to happen then and only then with no real alternative with media live and a crowd watching, was her landing at the slipway in Greenwich. 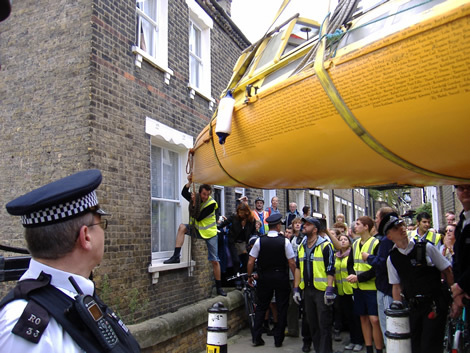 Apart from the media jostling to capture ‘the shot’ of Jason stepping off Moksha, they call it a slipway for a reason. It’s incredible that Jason made it off without damage. However, imagine if you will, standing on slippery cobbles with cold, wet water sloshing around and a 3000 pound boat coming straight at you with only ‘Roman rollers’ (4 fence posts) to defend her keel against the stones. The rollers must roll her up the slipway ramp to the reach of a crane. We also had to keep her even keeled, as in from rocking to either side potentially squooshing crew on either side backed by narrow concrete walls. Chris Tipper deserves credit for executing the idea that I, prior to Moksha’s arrival, merely accepted out of hand as being entirely do-able. Standing there at water’s edge, at the moment of her arrival, her bow scraping Greenwich cobbles for the first time, I admit my confidence wavered. But, the fence posts got pushed into place and began to roll. I looked at Moksha as she lumbering toward us, unsteadied by the waves of wakes from nearby media boats and quietly said “Come home”, and she did. I know she would have come without my invitation, but she’d been so good for so long it was time for her to just do what she had to do. We just helped. Maybe it wasn’t pretty, but it worked. Now strapped and held 15 feet overhead by a crane, Moksha had to be rotated mid air in close quarters surrounded by media and a crowd in order to be placed on the trolley that would carry her over the Meridian. ‘Close quarters’ is an understatement. Inches only between the buildings. My notebook and photo album don’t compare to the ‘movies’ of memories I keep playing over in my head. It’s all too big to really put into words. I played a very minor part in the expedition’s effort through the years, but know that the mission of the expedition to educate on the environment, promote world citizenship, and to know your dreams and follow them impacted my life forever. I’ve done things I never would have done without the experience. I think perhaps now I have a soul that is my true home port and is the only way I will ever find my way away. Thanks, Jason. I really did get the better deal. Pedal power, the pace for the human race.